Love this fixture! Tedious to assemble! But when it’s done, great looking!! Make your living space ooze sophistication and splendor with this decadent, shimmering chandelier. 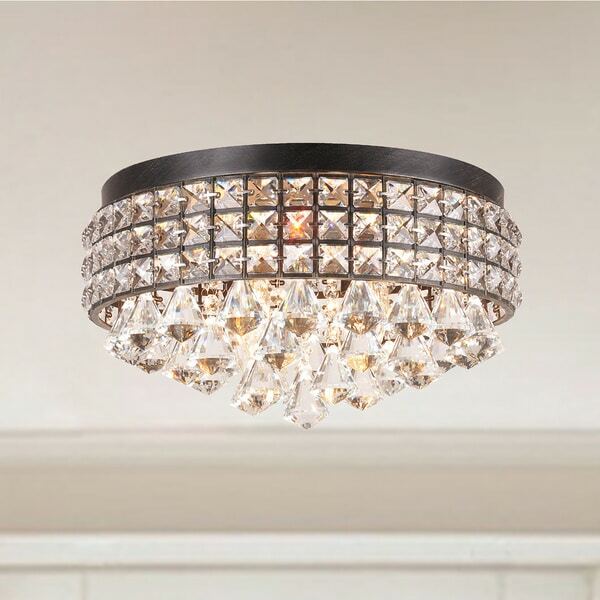 With a gorgeous antique black finish with a light brush of brown, this flush-mount treasure will scatter light elegantly around the room through its dazzling crystal design. 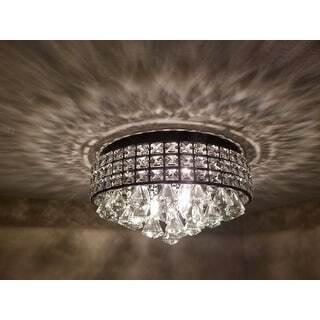 Love this crystal ceiling light! 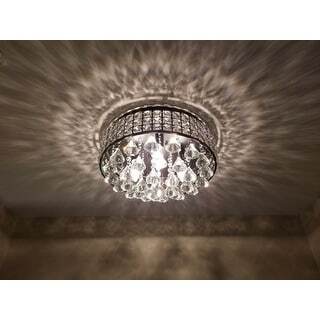 I absolutely love this crystal ceiling light! I put it in my home office/dressing room where I get dressed and do my make-up and it gives the room a very classy feel. I also love that it takes 4 light bulbs, so you can make the room very bright. This room in my house is naturally quite dark and I wanted a ceiling light capable of really lighting up the room and this does the trick! I put 4 CFL 60-watt equivalent bulbs (with chandelier bases) and they make the room incredibly bright. However, if you wanted a softer light you could use warmer less bright bulbs. 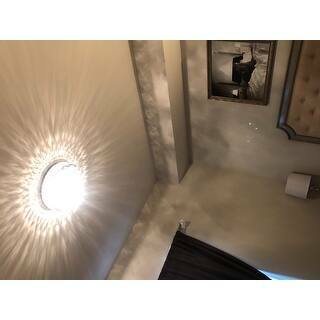 I am no electrician and I was able to install this light by myself after removing the existing ceiling light. Just do not follow the instructions which tell you to first attach all the crystals to the base before mounting it to the ceiling. I can't imagine how difficult this would be to try to mount to the ceiling with all those heavy crystals dangling in your way (and possibly falling off or breaking)! 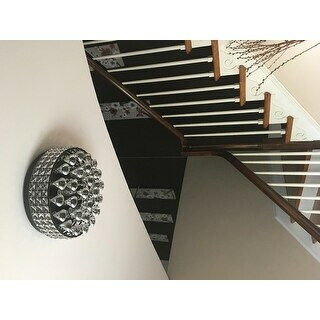 First, attach the flush mount/base and then once that is completely secured to the ceiling proceed to attach the crystals (I recommend attaching those at the outer perimeter first and then working your way to the center and also to wait to attach the large crystal to the crystal links until the crystal link is already attached to the base). The large crystal that hangs down is heavy and should be the last thing you attach in the process. Then once the whole thing is put together, add in the light bulbs. The light bulbs will be easy to change, as you do not need to remove anything from the fixture in order to do so. This means that the bulbs may be somewhat visible so choose nice ones! I did not have any problems with this light or its installation (aside from the bad instructions) and I highly recommend it, as it looks even better in person. The only other review for this fixture was negative. Luckily, there similar suggestions on the boarders of the page. One of those suggestions was for the same style fixture with a silver tone. I clicked on that and read the mostly stellar reviews of that fixture and made my decision to buy. It's one of my best decisions to buy! I am writing this review within the first 24 hours of hanging the fixture. Arrived promptly and well packaged. Useless paperwork, unless you're doing your first wiring job. I've wired several other drum shade crystal type fixtures and had no real trouble installing this one. Typical frustrations you'd expect if you've hung these kinds of fixtures, but this one is very well worth it! I do my installations all by myself. Mine had minor cosmetic imperfections that aren't visible from a foot away. YOU'LL BE HAPPY, unless you're a perfectionist with unrealistic expectations for the price. STURDY, WELL MADE, LOOKS GOOD OFF, LOOKS FANTASTIC ON. This piece is well worth the cost and beautiful. I have the flush mounted chandelier and the hanging one. Both are very nice. The flush mounted one looks a bit classier. It puts off a lot of light so you may want to use 40 watt bulbs instead of the 60 watt. The light creates interesting shadows and lights on the ceiling and walls. A WARNING: It's very time-consuming to hang all the glass crystals and I had a professional electrician install it. Chandelier was delivered a few days after order placed. The carton was well packed, protecting all parts, especially the crystals. After unpacking the ceiling canopy, crystals, and the remaining parts, I recommend checking the description and quantity of each item listed in the Instructions For the easiest installation install the canopy without any crystals or bulbs. First shut off the circuit breaker providing power to the existing ceiling box. Install the provided Universal mount plate with 2 supplied screws into the outer tabs of the existing box. Make sure the screws are properly tightened so the mount stays in place. The ceiling box black, white and bare wires should be routed through the center hole in the mounting plate. Raise the ceiling canopy close to (around 6") below the ceiling with a helper holding it. Connect the canopy bare ground wire to the mounting plate with supplied screw. Twist canopy to ceiling box wires, black to black then white to white and twist on clockwise the provided wire connectors until tight. Gently lift the canopy up to the ceiling, aligning the 2 preinstalled threaded studs matching the holes in the canopy (you need 2 people for this). Once the threaded studs protrude, install the cap nuts and tighten until the top of the canopy is flush with the ceiling. Do not install the bulbs until the crystals are completely installed. I recommend starting installation of the crystals from the center, then working each concentric ring until the outer rings are complete. Installing the crystal ring to the canopy takes times as you first have to open the small metal rings with your fingernail to attach to each location on the canopy. Now you can install the 4 light bulbs and turn on the power. All in all it took me the better half of a day to install and assembly all the components. The chandelier look fabulous whether lighted or not. It is definitely a bargain if you don't mind spending a few hours assembling. I highly recommend this flush mounted chandelier for a Foyer. The chandelier is absolutely gorgeous and gives off great light! I had two of them installed due to the design of our living room and they look great. The fixture is quite heavy with the crystals on, so the first one was tricky to mount (the instructions say to attach crystals prior to mounting), however, the second time around was a bit easier because I waited to attach the larger crystals which made the weight much more manageable. This is a stunning chandelier used to upgrade the tacky light put up by the homebuilder. I wanted to remain with a flush mount to "split the difference" between my style and my husband's no nonsense approach to decor. I used clear LED bulbs which makes this fixture even more vibrant. Once the first 5 or 6 crystals were attached, installation was a breeze. 30 minutes for attaching the large diamond-shaped crystals to the strings of crystals, 30 minutes for the wiring and mounting the base to the ceiling, 30 minutes to attach the crystals to the base. Simple 1-2-3 instructions included. The fixture (once assembled and mounted) is beautiful. It is a real process to assemble it though, and it is difficult to mount. However, once that is done it throws off some really nice light and it's a quality fixture that really enhances our entryway. Here is what I would suggest for an order of events for installation. This assumes you have turned off the breaker to the box, and removed the old fixture. 1. After you install the mounting plate to the electrical box in the ceiling, put the fixture on the mounting plate (before you hang all the crystals) and then mark the ceiling and the fixture so you can easily find the orientation again once you attach all the crystals. 2. Remove the fixture base and install all of the crystals 3. Have a second person hold the fixture close enough to the base so you can connect the electrical wires 4. Connect the wires 5. Remount the fixture to the base using your marks (it's heavy now with the crystals on it). Using the marks I was able to remount the fixture to the base in roughly 15 seconds. 6. Light it up ! You will be tempted to install the crystals after you install the base instead of before. Don't do it. You have to install 32 of them and it's much harder installing them with your arms over your head. OK. I think I have described the downside to this fixture. However, I am incredibly happy with this chandelier and am so happy i bought it. It is beautiful, elegant, and I feel it looks a lot more expensive that it is. I could not be happier with this purchase. This chandelier with the iron finish was perfect in my daughter's bedroom. It is actually much larger in diameter than I had expected. Really a statement piece. We installed all of the crystals and pendants before hanging it on the ceiling, and it was really heavy, especially since the installation took quite a bit longer than I had expected. It is definitely a two person job. I'd recommend attaching the small crystal strings before installation but then adding the heavy pendants after it's in. We also found that in our situation, the bolts handing from the ceiling plate were about 1/2 to 3/4 of an inch too long so the fixture could not be snugged to the ceiling. Tiny "rubber" washers from any home improvement store solved the problem--we had to use four on each bolt after the fixture was in place before the provided nuts would tighten the fixture up to the ceiling. Also, it is hard to find the bolts to get them through the fixture after the wiring is connected. After you find the first bolt, loosely connect with the nut, then place the flat of your hand, palm down, throught the ceiling opening. Locate the second bolt with that hand and the opening for the bolt in the fixture bottom with the other hand (be sure someone else is helping to support the fixture at this point!) and bring the two hands into alignment. Knowing that at first would have saved us a half an hour. Once installed, the fixture is breathtaking! The ceiling patterns are beautiful and the crystals sparkle--oh how they sparkle! We installed LED 4 Watt bulbs with the candelabra base and the small white part at the base doesn't show at all, so we have great light and beautiful bling while saving energy. Can't beat that! I purchased two of these for my living room. They give off good light. I'm using dimmablel LED bulbs with this fixture which was a key for me. The crystals are glass so they can stand up fo the heat emitted from an LED bulb. No problem with installation but was done by an electrician. Crystal drops are easily attached but time consuming. Stay relaxed until u get the feel for how the little wire ring slides onto the wire loop on the fixture, start from the inside circle and work outward. Read the instruction/diagram first. I just love it. Fast delivery. I always include Overstock.com in my top 5 retail searches. More often than not it's where I purchase from. We put this up in our entry. Wow, what a statement. We need to put it on a dimmer, because it will be really beautiful as dim ambient lighting as well. The patterns on the ceiling are wonderful. Looks like a very expensive fixture. It supposed to be a flush mount but the parts that were included didn't have the right screws and pieces to make it flush to the ceiling. So it was very wobbly and it looked semi-flushed. I had an electrician install it and it took over 4 hours for the electrician to come up with a creative solution to flush the mount to the ceiling. After that, I thought that it would be easy to install the crystals.....NOT! The manual was useless throughout the installation and it did not provide any instructions to install/assemble the very large crystals. To add to misery, the company provided only a few strass hanger clips to assemble the crystals to hook it to the base of the chandelier. Since it took 4 hours of a hired electrician, I had decided to keep this fixture because I fear that it will take another 4 hours to get it down. So I now have to order strass hanger clips to assemble the other crystals in order to hang them on the chandelier. The manufacturer is located in China and they were unable to provide useful information for the assembly of the crystals. If this item ever becomes available again, please avoid it because you will be in for unfulfilling ride with this fixture. Okay, I bought this chandelier two years ago but never put it up. I came home and my husband surprised me. It was up but I had to place the crystals onto the base. I did read the reviews which suggested hanging the chandelier then adding the crystals. I started in the center and worked outwards. It was a pain but you only have to do it once. It is actually stunning and so pretty. I love it. I was apprehensive about ordering this light fixture; however, based upon the reviews I ordered two of these and I'm glad I did. I put them in my master closet and they've made my closet look like a different room. I can't stop looking at them. They are bold but yet subtle and elegant. This fixture is so amazing. Don't be intimidated by the assembly. The box ships with several parts but a limited instruction page. First attach the long crystal strings according to the diagram. The small, round spring rings on the strings attach to the cotter pins that are already installed. To the bottom of the strings add the square wire with loop. Next install the fixture. 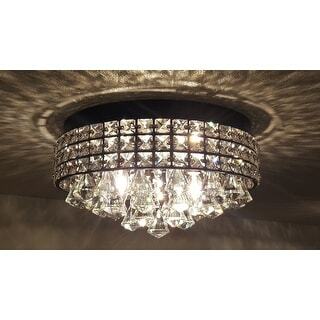 DO NOT put on large crystals (part #5) or the fixture will be too heavy to install. After the fixture is up and tested with a bulb in, take out the bulb. Install the 32 large crystals (#5) by spreading the bottom of the square wire. Four hands are better than two! Do this in daylight as it's a pain to try to hold a flashlight for this. My husband and I did it together and it went fairly quickly. Put the bulbs back and be amazed when the light is turned on. Gorgeous! The fixture arrives with extra parts and it is well wrapped. We used it in our foyer and it's just the right amount of bling. 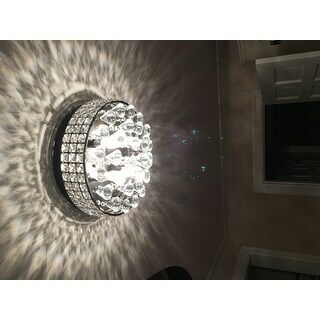 I ordered this light in hopes to give a quick facelift to my bathroom that seemed somewhat outdated. It looked very cute online. Once the light was assembled and installed, it exceeded my expectations. This light is beyond gorgeous! My whole bathroom literally sparkles now. Love it! This light fixture is just BEAUTIFUL...once it's mounted. 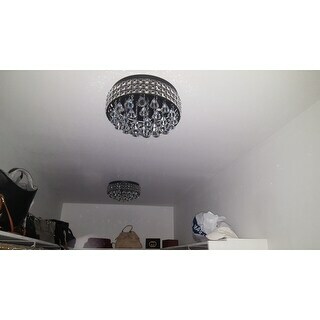 I have two of them in my large walk-in closet and they look perfect and put out a ton of light. My husband was not at all happy getting the base units mounted, but he's speaking to me again...so that's good. A couple of things before you start: * Installation is not easy at all. The instructions are VERY vague and you really have to think about your process before climbing the ladder to install. * It's heavy, even without all of the pendants...so be prepared to deal with that. * Don't follow the directions to install the pendants/diamonds before mounting, it will weigh a ton if you do that. This was our process and it worked best: 1. attach the packaged 2, 3 & 4 chains to the base unit first. This takes time to get the little rings attached to each of the tiny mounts...and there are 32 of them! It would be impossible to do this once it's on the ceiling. 2. then with those attached, connect the electrical and mount on the ceiling. 3. LAST, attach the (heavy) crystal diamond pieces to each pendant chain. This is also very tedious and you have to be careful they are properly in the holder. If you do this after the light bulbs are in, this sounds (and looks) dumb, but I had to wear sunglasses otherwise the super bright lights were too much for the long time it took me to attach all of these gems. We used chandelier (E12) Daylight LED's for efficiency and brightness - 2 each 40w and 60w. If we would have used all 60w, it would have been way too bright for our space. That's it...good luck! This chandelier is the cutest, sparkliest light in my house and I love it. 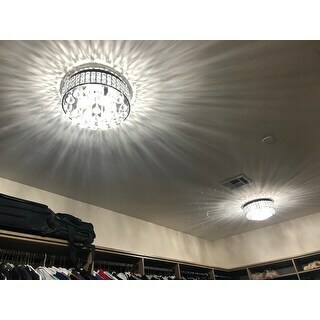 I wanted to “glam up” a dressing room and this was the perfect finishing touch. Fav, fav, FAV!! 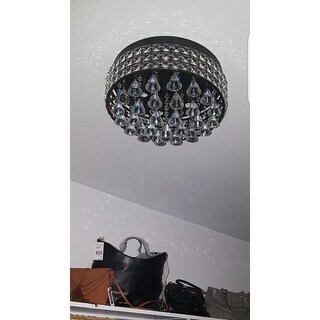 I’m obsessed with chandeliers and I originally bought this for my home office, but ended up putting it above my bed in my bedroom. It’s stunning! Spectacular! This alluminated my entire entryway and it looks fantastic and modern. 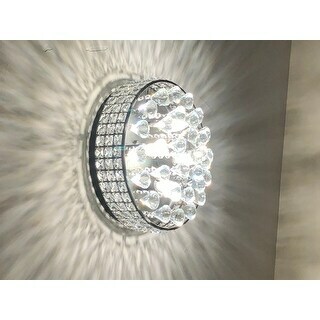 I would highly recommend this fixture for your home. 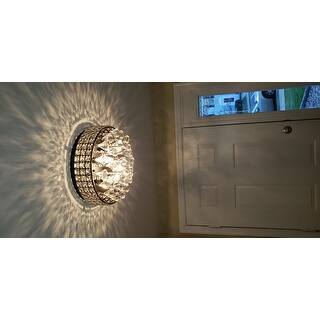 I love this flushmount light fixture! It takes a few minutes to attach the jewels after hanging fixture. I put it in my den over the desk. Gives really good light but not too intrusive in the space. Goes well with our modern farmhouse look. Package was delivered promptly and packaged well. Would definitely recommend for the price! Absolutely gorgeous light! Looks amazing and adds a little bling in my closet! "Is the piece attached to ceiling is separate from drum." The piece attaches to ceiling is the crossbar. Yes, it's separated from drum. "can this be hung in the bathroom? will it rust?" I believe it's powder coated, so I don't think it will rust. I love mine, but it is in my bedroom, not my bath. This can not be hung in the bathroom. It will rust in damp location. "l bought a chandelier from your can l look a t the design again ?" The manual will be on the product page soon as possible. 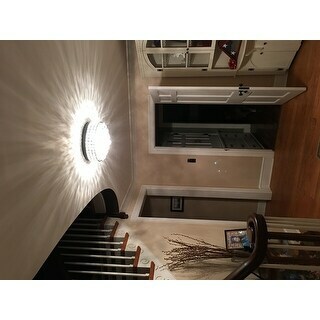 "I just received this fixture and it’s still in box and I think I will love the look. However, I didn’t notice when I bought it that it takes candelabra bulbs. Is this going to put off any light or will it be more atmospheric?" It will be more atmospheric. Incandescent, candelabra, halogen or LED bulbs can be used in this item. "In the description it says you may use LED light not included. My question is what size/kind of LED light can i use for this before i make my purchase? Thanks"
You can use E12 LED bulbs. The diameter of each bulb is 0.47 inch. It depends on how bright you want it to be, to me the E-12 bulbs were not bright enough for me. "Does anyone have a copy of the assembly diagram for the crystals? My contractor lost mine." Hang light to ceiling. Attach part #5 to part #2,part #3 and part #4 respectively. Hang part #2 to the outer circle of the lamp. Hang Part #3 next to the part #2. Continue with part #4. Hang the single longest strand to the center of the light. You will have spare parts. The email for the company is **. It sounds complicated but it is very easy to put together. It goes faster with two people. "I use Led lights in this fixture, will it still be safe"
Yes, thats what I used also. Using LED lights in the fixture is not only safe but smart. It uses less electricity to operate, cooler with less wasted heat and long lasting.